Pelosi said Sunday she had spoken with the House Sergeant at Arms about Omar's safety and that she wanted to make sure a security assessment was being conducted. In the Friday tweet, Trump wrote, "We will never forget!" 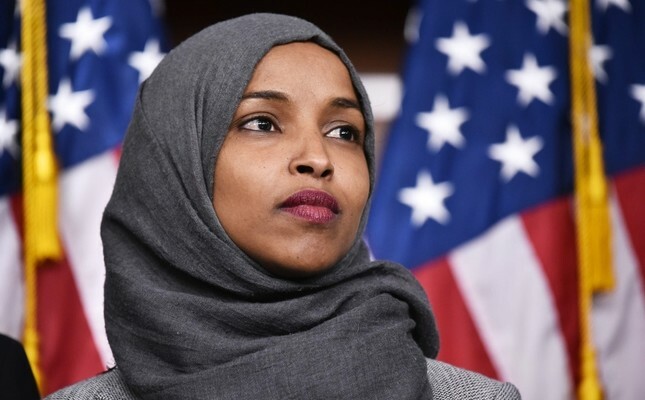 and included video of a speech Omar gave last month in which she said, "For far too long we have lived with the discomfort of being a second-class citizen and, frankly, I'm tired of it, and every single Muslim in this country should be tired of it. CAIR was founded after 9/11 because they recognized that some people did something and that all of us were starting to lose access to civil liberties." Omar in her statement said Trump was encouraging violence — which Sarah Sanders denied earlier Sunday in an appearance on ABC's "This Week." "Violent crimes and other acts of hate by right-wing extremists and white nationalists are on the rise in this country and around the world. We can no longer ignore that they are being encouraged by the occupant of the highest office in the land. Counties that hosted a 2016 Trump rally saw a 226 percent increase in hate crimes in the months following the rally. And assaults increase when cities host Trump rallies. This is particularly concerning given the president's visit to my home state of Minnesota on Monday," Omar said in her Sunday statement. "Violent rhetoric and all forms of hate speech have no place in our society, much less from our country's Commander in Chief. We are all Americans. This is endangering lives. It has to stop," said Omar.